We tip our hat to this year’s Tastemakers – seven chefs and restaurateurs who bring something different, fresh and exciting to the local dining scene. The country’s most successful competitive BBQ Pitmaster has relocated from Kansas City, Mo., to the Sunshine State, where he oversees the grill at the newly opened Smoke BBQ on Atlantic Avenue in Delray Beach. The new concept features authentic Kansas City-style smokehouse BBQ along with Carolina pulled pork, spareribs and more, including a large craft beer selection. How have you influenced culinary trends and/or the dining experience here? What we do at Smoke BBQ is basic ‘down home’ smoking, using a variety of woods to create different flavors. South Florida doesn’t have its own BBQ culture and many of the ‘BBQ’ places down here don’t actually smoke their meats, they oven roast. That is not real BBQ. What is your culinary ethos? My smoking philosophy is called ‘Smoke it Slow, Cook it Low.’ This means that I slow smoke at a low temperature. This infuses smoke into the meat while keeping all of its natural juices. I never compromise on quality. We use prime cuts of meats and the freshest ingredients in all of our dishes. What are your three favorite ingredients to work with? 1. Beef brisket because it’s a very rewarding cut of meat to smoke and not easy to get right. Smoking brisket is as much an art as it is a technique. Many BBQ restaurants won’t even offer brisket as it is very difficult to smoke without drying out, so they offer BBQ beef, which is an entirely different cut of meat. Some restaurants will offer chopped brisket, which is a way to hide dried out beef by mixing the point and the flat of a brisket together. 2. Pork shoulder because of its versatility. Our pork shoulders get a minimum of 12 hours of smoke. The end product is excellent as a topping on nachos or loaded tater tots, mixed with a Carolina vinegar based sauce for sandwiches or simply sliced and drizzled with some of our BBQ sauce for dinner. 3. Tamarind. I think it’s under utilized because it’s perceived as exotic, but it’s the secret ingredient in our sauce. It adds a sweet and tart flavor to the smokiness. Steve Chin and Scott Kennedy, the two owners of Smoke BBQ, are looking to expand the menu with some new dishes as well as expand the concept to multiple locations. They have tapped me to develop some new interesting dishes on our menu. In the very near future, we will be adding a smoked duck breast that will knock people’s socks off along with beef short ribs and on weekends a smoked prime rib that isn’t being offered anywhere in South Florida. Newly opened Sweet Dewey’s BBQ is a Mississippi-inspired eatery owned by longtime South Florida resident Chef Dwayne Hooper, and features recreated recipes from his mother and grandparents amidst favorites such as barbeque veal brisket, beef brisket, beef ribs, baby back ribs, Southern St. Louis ribs, Southern-fried catfish, and rotisserie chicken. Chef Hooper, nicknamed “Dewey,” spent years as a chef with St. Andrew’s Country Club and the Polo Club, both in Boca Raton. Prior to that he founded and sold Hooper’s BBQ sauce and plans to launch a signature BBQ sauce for his new venture. I have a passion for cooking, a love of fresh ingredients, and a love of barbeque. I do not change recipes and I do not compromise on using fresh and high quality ingredients. Garlic, fresh basil and sun-dried tomatoes. We just opened Sweet Dewey’s BBQ in Boca Raton and we’ve been sold out each day and night since we opened. I am looking forward to its continued success and possible expansion in the new year. JEY Hospitality Group Corporate Chef Robbyns Martinez is largely credited with breathing life back into Fort Lauderdale’s Himmarshee Village with his modern take on southern comfort food, burgers, creative cocktails, gourmet tacos and bar bites. Prior to joining JEY, Robbyns attended Le Cordon Bleu School in Miami and worked in the kitchens of the famed China Grill on South Beach and Miami’s Four Seasons Hotel. How have you have influenced culinary trends and/or the dining experience here? Sourcing local produce and sustainable ingredients has definitely influenced how I prepare dishes. With the invention of the gastropub, I have been able to explore so many different ideas with our menu items. With Marc Falsetto’s [partner in the JEY Hospitality Group] influences from all over the country, we built some pretty significant and creative menus and I think that helps us have an edge over other restaurant groups. Use local produce and sustainable ingredients. We like to support our local community. I think quality products and using the best ingredients really makes a difference. I wouldn’t want to use products that I know are less than perfect. The opening of another new restaurant from JEY Hospitality Group and the expansion of the ROK:BRGR brand will be important and a fun time for me as I grow my culinary experience. Chef Jacob Perego spent his childhood on the water in Louisiana, hunting, fishing and developing a culinary experience that was literally farm to table. Prior to joining fine Italian restaurant Sorrisi, he served as Executive Chef at Tanzy Italian and in the kitchens of Evo Italian in Tequesta, Taboo on Worth Avenue and The Breakers Resort in Palm Beach, as well as Havana Blue on the island of St. Thomas. Chef Perego holds a Bachelor’s degree in Culinary Management from the Florida Culinary Institute. It’s such a huge honor to be selected as a Tastemaker to watch in 2015. I believe we have influenced the culinary scene by making Italian fun again. We are not your mom and dad’s old pizzeria from the neighborhood; we are connecting generations of people with classic Italian flavors, along with modern flare and techniques. My culinary ethos is simple: always use the highest quality of products and treat every guest as if he/she is a member of the family. If it’s not on my menu and I have the ingredients, just ask. If I know how to make it or you have good directions, I’m glad to make it, and my goal is to make it the best of that dish that you’ve ever had. Number one is definitely butter. Butter is the Holy Grail. Forget the fad diets and low carb/gluten-free or whatever new diet that comes out next week; for me, there is one staple that will always be, and that’s good old butter. Number two has to be fish – any type of fish – fresh or salt water. 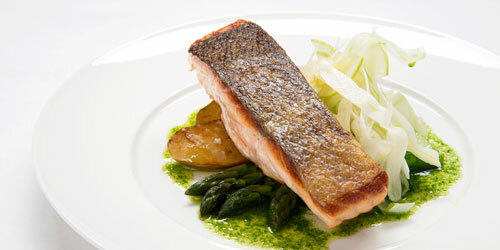 Fish is the most versatile ingredient and can be integrated into so many different varieties of dishes. My third favorite is probably fresh herbs. There is something special about the earth providing natural flavorings for dishes that create unique combinations. My three favorite herbs are by far basil, oregano and sage. Although I’m happy with what I’ve accomplished so far, I am not content. I want to be the best chef ever. It’s going to be a fun ride trying to get there. I have a new generation of cooks to teach and inspire. I try to instill the craft in them, so they can evolve and, one day, pass the craft to future generations. Sorrisi is a special place and I give a lot of credit to my team, they have bought into my vision and execute it daily. Executive Chef Christian Rassinoux joined the Diplomat Resort & Spa in 2013, bringing his culinary expertise to the hotel’s various food and beverage outlets, including their award-winning Prime restaurant. Having worked for some of the world’s most prestigious hotels including the MGM Grand in Las Vegas and various Ritz-Carlton hotels as Executive Chef, Chef Rassinoux oversees the culinary strategy for groups and restaurants at the Diplomat. Chef Rassinoux holds a Doctor of Culinary Arts, Honoris Causa, from Johnson & Wales University and has received many noteworthy accolades, including Chef of the Year 1986 from the French Culinary Association, Chef of the Year 1990 from Le Toques Blanche International, and Chevalier in the National Order of Merit by the President of the French Republic in 1994. I feel that I anticipate and fulfill each guest’s needs. We chefs are alchemists, looking for the apogee, which we will never find because we must be our own worst critic in order to continue our progress and evolution for the future of cuisine. With restraint, creating a fusion can be fun. I like to play around with flavor, especially Asian cuisine. It would take a lifetime to discover all of the regional Chinese cuisine or some incredible Indonesian dishes. I do not believe in ‘one world, one cuisine.’ With respects for other cuisines, I feel chefs should experiment in the kitchen. Chefs will not become mad scientists. Although our creations do not hang on a wall, we are artists. They may not know it, but many chefs are still using the classic integrity in their reinvented cooking. Between the evolution of culinary classics and ingredients from the world’s garden, we have something on the move. Where do you draw the line and refuse to compromise? In the hospitality business, it is very difficult to draw the line. As a host you must always comply with the guest’s needs and wishes. Never say no to a guest [in good measure, of course]. My style is very much influenced by my travels and discovery of different styles of cuisine. In the end, we need to preserve the integrity of each cuisine in relation to the culture of the country. I love to utilize the flavors of the world in perfect harmony with the evolution of classic cuisine. I will not let fusion equal confusion in my kitchen. I believe in Zen. Zen in nature. Zen in creativity and cooking. I want to promote the flavor of the main ingredient, which must be top quality. I like to work with fish, vegetables and extra virgin olive oil. Giovanni Rocchio is the man behind Fort Lauderdale’s Valentino, once the “best kept secret of local foodies.” The restaurant now occupies a larger and more prominent space and is filled nightly with regulars and visitors who come for a taste of Italy with a modern twist. Exceptional culinary techniques and powerful flavors highlight Rocchio’s dishes and we’re about to see much more from him in 2015. Valentino Cucina Italiana was the first restaurant in Fort Lauderdale to create innovative out-of-the box cuisine with a modern Italian twist. We took a risk because I felt like it was my obligation to show people what real Italian food is. We took a chance and people were receptive to it. I refuse to compromise on how involved I am with the restaurant. I have been hands on from day one and will continue to do so. I also won’t compromise ingredients. I will never settle for an inferior product. 1. Variety of flours, because we use it to make homemade bread and pasta. 2. Scallops, because they are very adaptable to a variety of preparations. 3. Olive oil. Imagine a kitchen without it. What excites you about your work in 2015? 1. Our new restaurant One Door East will feature globally inspired tapas without boundaries. 2. Valentino’s Guest Chef Wine Dinner Series, Feb. 16th and March 16th. We will take our patrons on a culinary journey through Italy with world-class chefs from Michelin-rated restaurants in Europe. 3. Our plans to open a bakery – baking is my new passion! Chef Philip Darmon embarked on his culinary career at age 16 in Sydney, Australia, and spent the next years working in the kitchens of five-star hotels, gastro pubs, restaurants and bistros in London and around Europe before taking to the sea to spend 12 years as a private chef aboard luxury superyachts. The yachting industry brought Chef Darmon to Fort Lauderdale, where he met his wife Jessica and settled down to open Hardy Park Bistro, a casually sophisticated dining house with a seasonal menu and beautifully inspired dishes that is winning critical acclaim. After only a year in business I don’t feel we have influenced our scene at all. We are too young; it is too early. That being said, I do see a couple of our dishes popping up on certain other restaurant menus, and that is flattering. A hashtag we use is #simpleisbest; we are not trying to reinvent the wheel here at HPB. We spend good money to make sure we have the best possible suppliers and we cook the food here, we don’t buy our ice cream, pasta, etc… from outside. How can you call yourself a chef if you don’t cook the product you sell? We are not a gimmick restaurant. For instance, we only have a beer/wine license, and have been told we should do sake Bloody Marys for brunch. Rice wine does not make a Bloody Mary; we will never do it. Where do you refuse to compromise? We will never use sub-standard or average products. We place a lot of importance on the people we hire. Eggs, salt and olive oil.